Set in modern day Mumbai, the family matters at hand are those of Nariman Vakeel, his two step-children, his daughter and her family. Currently living with his step-children Coomy and Jal, the ageing Nariman falls and breaks his ankle causing an increase in his care and an increase in resentment from Coomy and Jal, with Coomy becoming more and more desperate to be rid of the old man. Roxana, Coomy and Jal’s half sister and Nariman’s daughter, lives with her husband and two children in a tiny apartment, and it is here that the scheming Coomy successfully off-loads Nariman. When the two week stay becomes four and then six, family relations become strained. Roxana’s husband Yezad becomes increasingly suspicious of Coomy and Jal. Roxana is torn between the love and obligation she feels towards her father and understanding her husband’s frustration, their living arrangements less than ideal before Nariman arrived and the strain of another mouth to feed and body to house proving too much. For Coomy, it is the desperation at stopping her step-father from returning that takes her schemes to new heights and her brother Jal, an unwilling participant in all of these plans is guilt-ridden about the whole thing. At the centre of it all is Nariman; with his body betraying him, it is his mind that he lets wander, remembering his past and the road to his current situation. There is so much that is familiar in this story and so much that is exotically foreign to me. 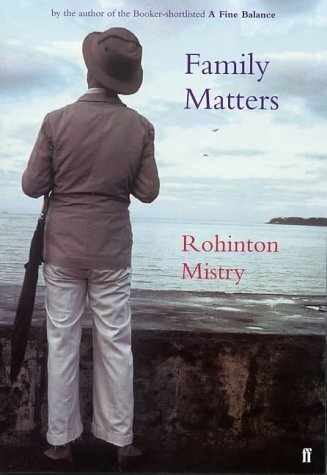 Mistry’s words creates so vividly the colour, smell and feel of Mumbai. Beyond the physical surroundings, the Zoroastrian religion plays a big part, what it means to them to maintain their Parsi heritage and all that this involves. In creating this setting we also have our colourful side characters adding levity with their humourous idiosyncrasies and each playing their role in contributing to the turn of events. The world created is full and distinct, where I felt that I was plunged into somewhere that I could clearly imagine despite never having stepped foot in India, never having known about the Zoroastrian religion, so much of it alien to what I know and have experienced. For all this difference to me and my physical world, there is much of the actual family issues that I could relate to. Nariman also has Parkinson’s and as he ages and starts to fail physically it isn’t rage and anger he feels but the need for reflection and from this regret. His awareness of how burdensome he has become is heartbreaking, as is the toll that his presence is taking on Roxanna and her family. The financial struggle of this family is all too familiar. As is the idea of dashed dreams, wanting more for your children and being worn down by the daily grind. These are not themes particular to this part of the world; these are some of the most basic of human concerns. Yet for all this understanding of their situation, it is never allowed to become mundane and too commonplace as there are still touches of melodrama, especially with Coomy and her scheming. She is a great character, faintly ridiculous but ultimately proving to be the antagonist of our story. This is a very full and rich novel. Complex in some respects but simple and familiar in others, all things that can describe families everywhere. Highly recommended to those who love India, enjoy great characterisation or who have family matters of their own.